An enormously popular tippy green tea with sweet vegetal taste and enchanting floral aroma. As an office worker, I daydream from time to time. I daydream I could retire early to an idyllic corner in China, where I would meditate early morning, sip tea and talk, watch the day go by in a stroll. Hangzhou is the tea capital of China, but it is commercial and touristy. Lhasa is the spiritual heart of Buddhism, but it can be harsh and remote. 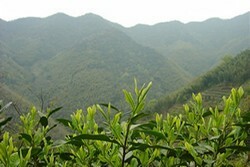 Then there is Wuyi Mountain: the world depository of tea plants. And at the top of my mind: Yellow Mountain (Huangshan). Yellow Mountain is the tallest mountain range in Eastern China, with the highest peaks reaching 1,864 meters. Alongside Guilin, it is considered by many to be the most spectacular of Chinese landscape. Great scenic mountains produce great teas. This saying is nowhere truer than Yellow Mountain. Although Houkui tea is the youngest of the Famous 10, he was the first to win international acclaim. It joined the celebrity circus in 1915 when it won the gold medal in Panama Pacific Exposition and became the first tea to win an international award in modern China. The award-winning Houkui tea came from the famous villages of Houkeng, Hougang and Yanjiacun. The tea gardens reside at an altitude of 700 meters, surrounded on its 3 sides by the scenic Taiping Lake. It is an out-of-this-world paradise. Breathtakingly beautiful. Despite its natural beauty, Taiping Lake is still not widely known in China. It probably is just a matter of time. 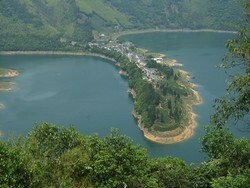 The Lake has recently been voted as the most scenic Lake resort. In the world of Houkui tea, size matters. The larger, the better. In fact, the word Houkui means Monkey Chief. So called because it is made from the largest and stoutest tea shoots from the Monkey villages. It is one of those few teas that I get easily excited about. 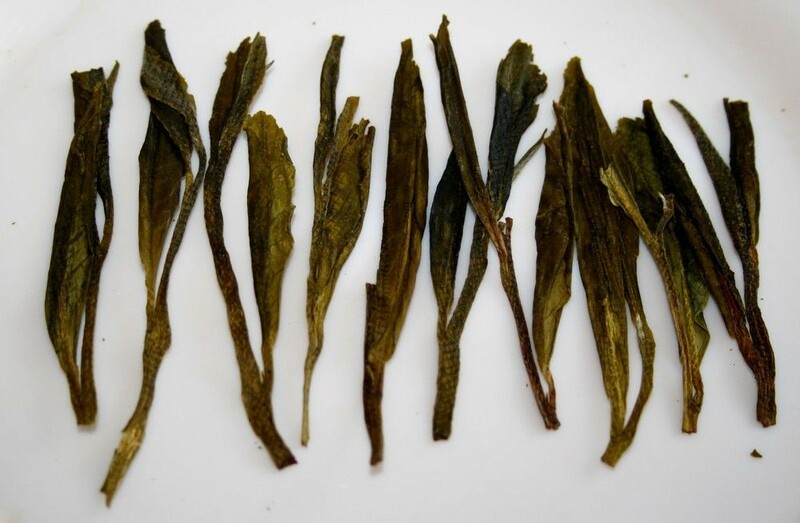 While Eastern China is dominated by small-leaf varieties, Houkui tea plant produces enormous leaves of up to 15 centimeters, which shrink to half the length after processing. Can you believe it? The harvesting takes place over just two weeks in spring. The tea shoots grow this large in a matter of days! Whether you are based in China and the West, it is hard to get consistently high quality Taiping Houkui tea. 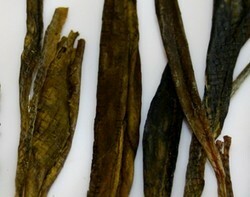 Tea buds are large and flat. They lose freshness easily if cold storage is not available. I am therefore very pleased to be able to share this AA grade with you! Rest assured you will get wholesome tea leaves that are fresh and aromatic when they arrive. While the leaves are big, they somehow retain the pointed shape of a high grade. The one-bud-and-two-leaf are known as "two knives and one pole." You can sometimes detect the crisscross patterns and faint red veins. 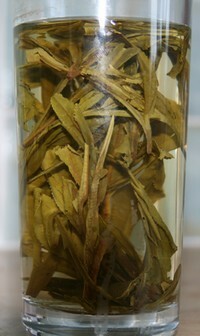 The pristine mountain conditions gives Houkui tea a unique flavor known as the Monkey Yun. You really have to taste to understand it. Personally, I would probably describe the flavors as a full-bodied sweetness with a wonderful vegetal and aroma. She is very easy to like. We have a small amount of leftover from the 2016 crop and has discounted them heavily for quick sale. Quality of last year's crop is still high as we store all our high grade teas in freezer under -20 degree Celcius for maximum freshness. We are confident you will be happy with the quality. Although I'm a tea drinker for a few decades, and tasted lots of teas, still I'm not able to bring myself to give any expert advice on a specific tea. 1. You are supplying the best teas that I know, except may be some extravagant collectors items. 3. Still, after some experimenting, I must say that the Taiping Houkui tea is just amazing. I was not aware that there can be such a tasty tea. I would certainly rate the Houkui tea 5. Slight changes in quantity of tea or steeping time are giving a range of enjoyable tastes. You can publish my feedback whenever you want, don't need to ask. The Monkey King maybe my favourite green tea (or Anji Bai Cha), it has a lot to live up to, though I have only had low grades before. This tea blows them out of the water, especially when opening the bag. I'm very satisfied. I give it a 4.5 out of 5. The leaves are a mix of medium and long, the longest being about 9cm, but I am slightly surprised by their appearance, I think I expected the individual leaves to be long, but the overall length includes some stalk. This has no apparent detrimental affect on flavour. Julian, I have never seen leaves like this! They are long, gorgeous, and unfurl in the most beautiful way. And the taste....subtle and delicate. So different from "the usual" in stores. My cupboard is filled with old colored coffee mugs. When I drink the Taiping Houkui, however, I always try to find a white one, so I can see the light green color as the tea leaves unfold and brew. It turns teatime into a special treat. Thank you for making your teas available at such a wonderful price with free shipping, recently! I placed an order a few days ago for yet another one - can't wait to try it! PS: love your newsletters, I always learn something. Cheers from Michelle in Oregon, USA! The 2009 Green Monkey King, has an absolutely wonderful aroma. However, I got two bags, and noticed an inconsistency in the aroma and flavor between the two bags. One of them was green, and flowery, the other had more of a roasted vegetal aroma. I can not rate this higher then 3.5 because of the inconsistency of the bags. However, I would absolutely buy this tea again. It has a light, gentle soft flavor, floating and cloud like on the palette. Each one of the bags offers a slightly different flavor. Thank You for providing such awesome tea! Iâ€™ve just brewed my first cup of Taiping Houkui and found it vastly superior to another (much more expensive) variant I recently purchased here in Germany. Of the three different batches of Taiping Houkui I have tasted as of now (including this one), it is clearly by far the best, so Iâ€™d have to give it a 5. I could already tell from the smell when opening the package that it would be superior. I am looking forward to tasting the other teas in this shipment and will certainly do business with you again. Personally, I like to drink the Money Chief tea full-bodied. Use 3 grams of leaves in 8 ounces (225 milliliters) of water. Brew using high temperature water for as long as it takes. This tea is not widely known in the West, but for those who have tried, it is a real treat.